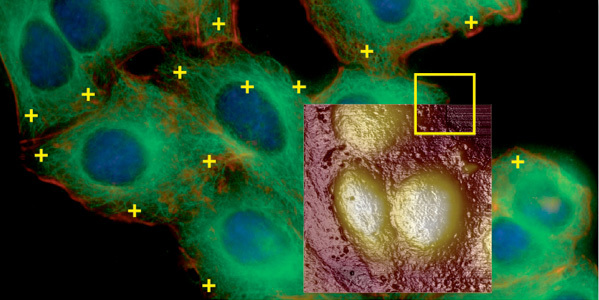 Correlation between fluorescence intensity and specific AFM force measurements on living Hela cells. A tip was functionalized with a toxin able to target any inositol-containing molecule. Fluorescent cells over-express GPI-anchored proteins and exhibit a high number of specific unbinding events (yellow retraction curve) whereas for most of the non-fluorescent cells, no event (red retraction curve), or a much lower number, can be detected. 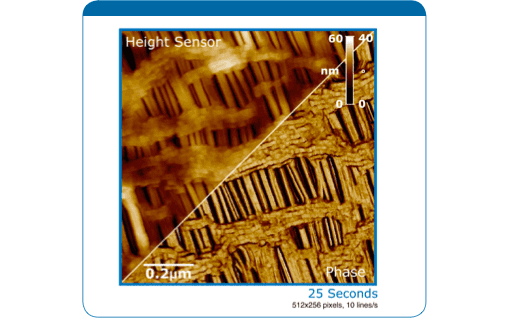 Celgard® oriented Polypropylene membrane (TappingMode, Broadband-A Probe) is a good indicator of AFM force control. Tracking error would cause lateral forces to separate and damage the smaller strands. 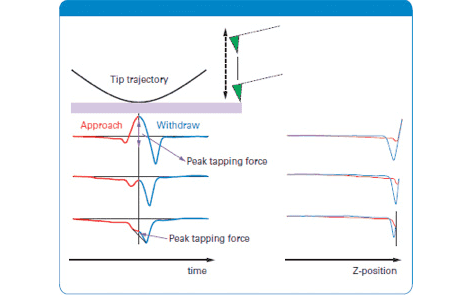 Experimental data of force curves for a cantilever operated in PeakForce Tapping. The lever is driven by a sinusoidal wave and the curves are displayed as force versus time and force versus distance. 1μm scan of Origami DNA in buffer solution using ScanAsyst. Height or topography (left), Capacitance (SCM) dC/dV amplitude (middle), and Capacitance (SCM) dC/dV phase (right) images of a conventional Silicon DRAM cell. Topography (left) and tunneling　current (right) images taken on a 1.2nm thin　aluminum oxide (Al2O3) film at a sample bias　voltage of 0.14V. 500nm scans, 5 pA current range. Data courtesy A. Olbrich, Infineon, Munich, Germany. 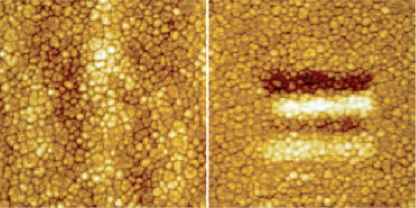 Topography (left) and FM-EFM (right) images of a　ferroelectric film with electrical bits written onto it. 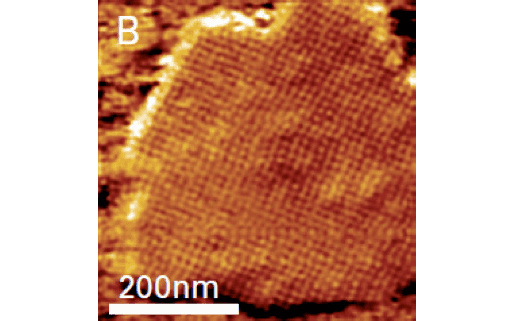 PF-TUNA images of a Li[Ni1/3Mn1/3Co1/3]O2 composite cathode. 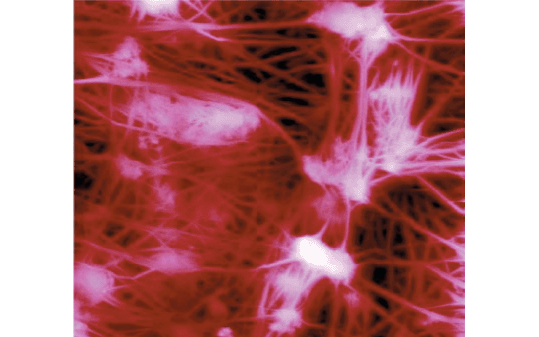 Sample courtesy of Dr. Zheng and Battaglia, Lawrence Berkeley National Laboratory. 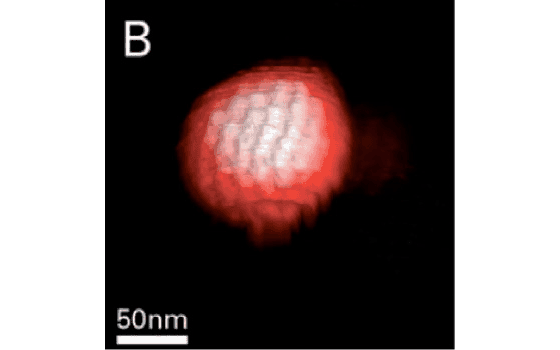 A 250nm AFM Topography image of a single herpes simplex virus　capsid. Sample courtesy of Wouter Roos and Gijs Wuite, Vrije Universiteit, Amsterdam, Netherlands. 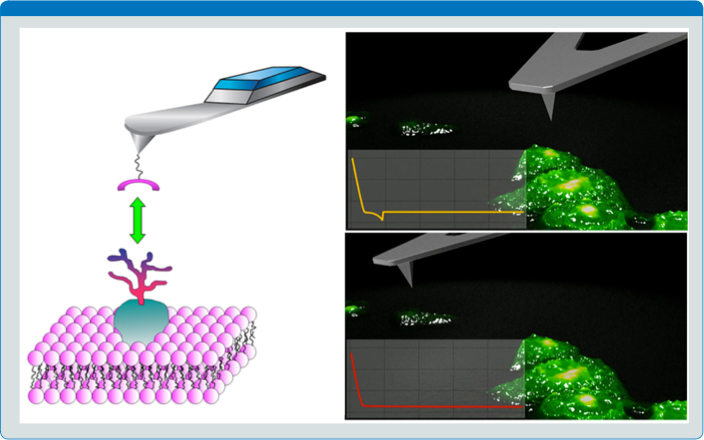 In the MIRO canvas, the fluorescence image is used as a background to target AFM measurements. Cooling of polymer blend of syndiotactic polypropylene and polyethylene　oxide. g-i show the modulus. 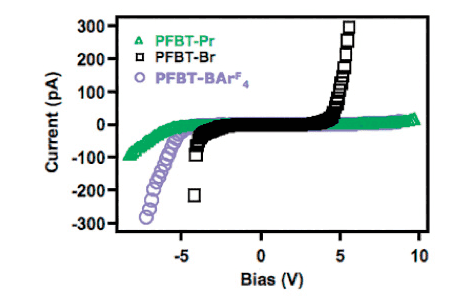 PeakForce TUNA images of P3HT:PCBM solar cell with a PEDOT modified ITO/glass anode. Shown are (a) topography, scale 10nm;(b) Cycle-averaged Current, scale 5pA. 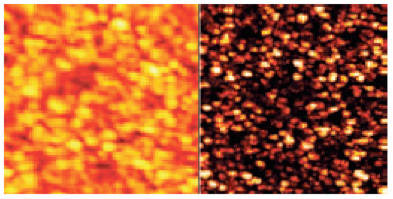 Imaging and probing of D-Ala-D-Ala sites on living bacteria. 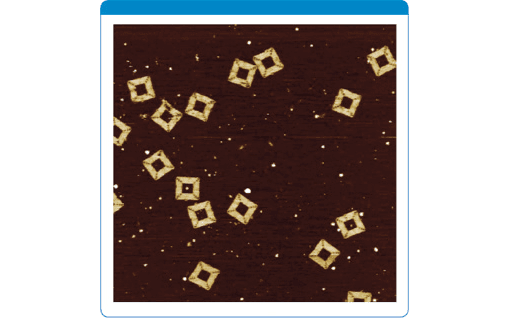 Copyright (c) 2016 - 2019 Bruker Nano Surface Analysis All Rights Reserved.